Midnight Sister, on their debut LP Saturn Over Sunset, are emblematic of the analog swell of early Broadcast, The Free Design, and The United States of America. They also convey a cinematic sweep on tunes such as the opener "Canary," evocative of the ethereal leanings of the score of Rosemary's Baby. 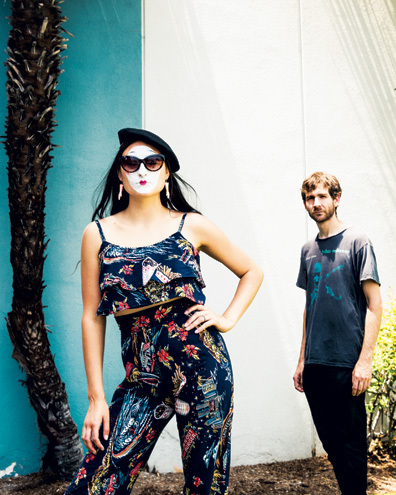 The Los Angeles based band, composed of Juliana Giraffe and Ari Balouzian, aren't offended by film comparisons in the least, as they've cut their artistic teeth in that medium to varying degrees. "I'm a filmmaker, and this is the first time I'd used music to tell a story," says Giraffe. "I've directed music videos and short films." Balouzian has been involved more on the compositional end, working with both directors and musicians in the past, including arranging for Tobias Jesso Jr. "I'd never used the structure of a pop song. I'm classical," he says. "I worked in scoring, playing viola. I've worked with directors, so this was the first time I'd used it as a pop song medium, and it was a challenge." The Midnight Sister project began in earnest when the band's first song, "Leave You," was featured on Bandcamp and heard by an A&R representative at Jagjaguwar. The label promptly signed the band, who had been working on other tracks piecemeal over the course of months. "Ari would send me instrumentals over email and we'd never set out to record an album at first. It came out organically and snowballed into something that became an album," says Giraffe. "I was working at a retail store where I had a lot of downtime, so I'd write there after observing a lot of things on the street and thinking about how the songs made me feel. It was a compilation of different characters. As we were writing, we wanted each song to become someone different." "It felt like we were faking 45 singles, and then we thought it was an album," Balouzian says. "It's character based. Juliana's writing about herself through characters to some degree." Giraffe adds that both were keen to capture a cinematic quality within their music, for pragmatic purposes. "Songs and albums are a lot bigger than yourself and cheaper to make than films," she says. They both wax rhapsodic over David Lynch's ability to pair film and music, with Balouzian marveling at how Lynch crafted the first episode of the new Twin Peak's sound design personally. The act plan to make their live shows as theatrical as possible, and will be augmented by a full band. "That it translates into a performance outlet with a band is kind of cool," says Giraffe. "For me to be able to wear different types of makeup to cover my face in a weird way is really fun and to stage things in a different way." They feel a kinship in the L.A. scene to Julia Holter, a similarly theatrical act, and profess a strong love for the now broken up Girls, whose J.R. White mixed their album. But they ultimately realize that this is uncharted territory for them, coming from the backgrounds they do, a quantum artistic leap, and are anxious to head out on a nationwide tour supporting D.D. Dumbo and continue working on new songs. "Most of these songs are old," says Balouzian. "We want to write new material. It's just cathartic and fun for us right now. We can just make these themes and build them out of nothing. These ideas come across. Just creating that and making more visuals and bring people into the world we're trying to create is what we ultimately want to get out of this." Midnight Sister is a good band from Los Angeles.